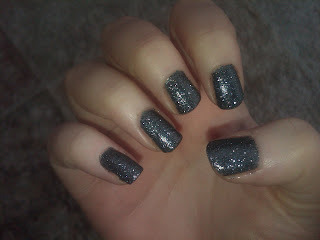 Yesterday, I painted my nails with Chanel's Black Pearl but it quickly lost my interest. I knew I was going to choose Milani Silver Dazzle next, so today, I anxiously redid them. ﻿For a fraction of the cost, I'm much happier with Silver Dazzle. It's a gorgeous gunmetal silver hue with lots of glitter. It dries to a somewhat dull finish, so I applied Seche Vite for a top coat and it transformed the finish into something completely out of this world. I love it! I highly recommend the Milani One Coat Glitter Polishes. You can get away with one coat but I suggest 2-3 for more impact. It's a great buy and one of my favorite colors in my collection. *Possibly the longest title and artist name combination ever!